The newest generation is about to enter the workforce: the oldest members of Generation Z, born in 1997, are at the forefront of a demographic that numbers about 61 million and will change the way companies attract young talent. When it comes to attracting, engaging and hiring Gen Z, though, recruiters should take some time to understand the world they grew up in. This is a generation that doesn’t remember a time before social media, cell phones or even dial-up internet – at the same time, this generation grew up in a time after the 9/11 attacks – in fact, most only know about 9/11 from school text books – and watched their parents uneasily navigate the financial difficulties of the 2008 market crash. These experiences, like the experiences of generations before them, serve to shape Gen Z’s worldview and expectations. Recruiters need to address the challenges that this new group will bring to the recruitment industry, which means understanding the best ways to attract Gen Z talent: mobile recruiting options, engaging employer branding and a savvy social media presence. In a world where 90 percent of text messages are read within the first three minutes of being received, text recruiting should already be top of mind for most recruiters. Since Gen Z was raised on technology in ways that no other generation was, it’s clear that mobile recruiting will take on even more importance in coming years. Members of Generation Z jump at the chance to apply for jobs and connect with recruiters through text messaging, getting instant results and not worrying about missing out on a potential job opportunity because of missed phone calls or lost emails. Employers already know that their branding must be on-point to attract millennials and Gen Xers – but how will that change for Generation Z? For one, employers still need to showcase authenticity in their branding, like employee testimonials. In addition, though, employers need to make sure that branding is consistently promoted over different platforms. Generation Z is the most connected generation and engages on multiple online platforms – if they see that a company brand differs from one platform to the next instead of providing consistent messaging, they may end up being turned off to the brand entirely. Social media is the most ideal way to attract and engage with Gen Z talent, considering that more than 90 percent of adults between the ages of 18-29 are active on various social media platforms. Companies can take advantage of social media branding opportunities, such as employee video testimonials and videos promoting their company culture, while also allowing Gen Z candidates to apply for jobs directly from mobile-optimized social media pages, providing Gen Zers with a candidate experience that mirrors the types of consumer and entertainment experiences they’ve come to expect. The one platform that ties text recruiting, employer branding and social media together is mobile. Recruiting through mobile optimized pages and career sites, as well as interacting with candidates through SMS or messaging apps, should be a serious consideration for any employer who wants to attract, engage and hire this newest addition to the workforce. TextRecruit, an iCIMS company, allows recruiters to leverage text messaging, online chat capabilities, and AI to communicate with job seekers, providing a great all-around experience for recruiters and candidates. Integrating TextRecruit with the iCIMS Talent Platform helps manage recruitment complexity by consolidating all hiring-related communications on one system of record, offering stronger data governance, easier applications and more efficient and consistent communications with candidates. 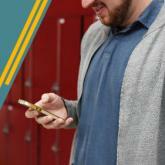 Don’t wait until Gen Z enters the workforce – find out how a mobile recruiting experience is essential to millennial recruitment in our TextRecruit infographic, Attract Tomorrow’s Workforce, Today with a Mobile Candidate Experience.